When Adalwolf Stein and Arija Rapp discover a mechanical world hidden deep within the earth, the result is life changing. Webley and the creators of The World Machine work to keep the Earth turning. But when Arija and Adal discover a growing conflict that will destroy the Earth, they find themselves forced to fight. 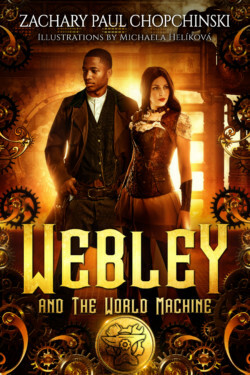 Webley and The World Machine is a YA Steampunk featuring two snarky and fun eighteen year olds, a dwarf-like giant and a whole slew of odd mechanical creatures. If you’re a fan of Wild Wild West, sassy characters or all things steampunk you’re going to love this book. WARNING: The characters in this book have a mind of their own and enjoy swearing and generally getting themselves into trouble.